If you're a reader of this blog or a follower of mine, odds are you know who Ken Whitman is. Let's just say that he is one of the most talked about people in the industry, and the news coverage of him hasn't been exactly balanced. Let me be clear before I proceed: I have no stake in this game. I barely know who Ken is myself, I have never backed or even followed any of his projects, and have not followed the details on how he has acquired the reputation he apparently has. I'm am as impartial as they come on this topic. Suffice to say, Ken's been talked about on numerous websites and blogs, some of which are dedicated almost entirely to him, and the general narrative has been - I must admit - overwhelmingly one-sided. As a result, he admittedly hasn't had a much a chance to respond himself on a venue that isn't against him in every possible way. One reasonably well known blog offered him the opportunity to post his side of the story over all this, to which Ken declined because he didn't want to drive traffic towards that site. So that's where I came in... I offered my site as a sort of "neutral ground". Like I said above, I have no opinion of this matter, and as such agreed to post anything Ken wishes to say without commentary or counterpoint, just to get his side of the story out without any bias. And, if possible (I'm not sure how; I've never done it before), I will prevent comments from being posted because I don't want to be a full time moderator and I want to let his statement stand as it is. So, hopefully, this will be the first of many responses... I have no idea how this is going to go, but here goes. Before we continue, a little background. 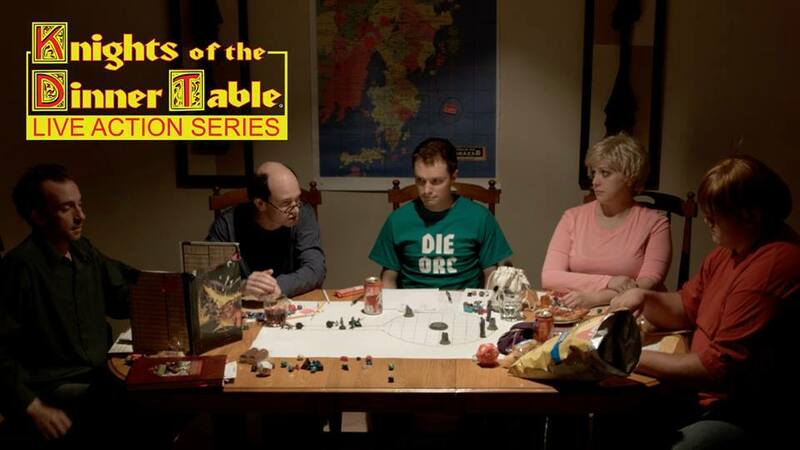 Yesterday, the Knights of the Dinner Table: The Live Action Series - one of the Kickstarters that Ken was involved with a while back - was apparently released to backers without Ken's involvement. The post detailing that release can be found on Jolly Blackburn's Facebook feed. As is stated in that post, "D20 Entertainment did not participate or help in this development". I'll say again: I know little about this project. I was not a backer, and barely even know what the project is or what has been involved in it. And, in an effort to remain impartial, I have not gone out looking for such information because, as I've stated above, the information that's out there is apparently very one-sided. In any event, Later in the day yesterday Ken contacted me through Facebook Messenger to post his response to that. About 2 years ago, I turned over the KODTLAS footage to Z.O.E. and today, both ZOE and Jolly Blackburn, announced are releasing all three Episodes of KODTLAS. Now matter how much I may not enjoys Jolly's company personally, I can not belittle his amazing talent. Jolly is a true genius when it comes to storytelling and everyone at Kenzer was top notch to work with. It was never my intention to take this long for people to see all three episodes, but due to a turn of events in my life, it did not allow me to financially keep working on the project. I messed up ran out of funds, and had a hard time paying for the project to continue out of my own pocket. I could talk about the online slander/libel posed many times over the past two years about never turning over the footage, but why open old wounds, they fact is I did turn it over to ZOE. I hope you enjoy watching them as much as I enjoyed directing them. I will continue to work on this project in my free time, hopefully finishing up the project in the near future. To Jolly, Kenzer, the actors, the crew. It was an honor working with you. ETA: After confirming with Ken, he has agreed to let me turn on comments for today only, and he has agreed to respond to them through this site (whether he'll do that in the comments or post separately, I don't know yet). I am not going to be moderating the comments until late in the day (I don't have time for that during working hours), so please be civil. Ben Dobyns of Zombie Orpheus Entertainment has provided a response to this. To keep everything together, I'm adding it here. Hi, this is Ben from ZOE with a few facts regarding the KODT situation. Several years ago Ken mailed me a hard drive that included a) all of the raw footage from Episode 1, b) some raw footage from episode 2, and c) ZERO raw footage from episode 3, along with a Final Cut X file of his work on the edit. The plan was to complete post-production for him and return the completed project for distribution to backers. Despite repeated requests over several years, Ken did not provide the remaining footage. His reasons (on the record) have changed several times. Ken's rights to the KODT IP and the live action series footage contractually expired on December 31st of 2017. Following that date, by mutual agreement with Kenzer ZOE set out to release the "rescued" edition to the original Kickstarter backers. What was released to backers yesterday was cobbled together from the hard drive that Ken originally sent, SD assembly cuts from Jolly's dropbox, and so on. It is a "rescued" edition in every sense of the word. Unfortunately, I've lost thousands and thousands of dollars to this mess. But because my name and reputation were used by Ken in order to secure the KODT film rights (yes, I have the paper trail to prove this claim), I felt a personal responsibility to get this project released: for Kenzer, Jolly, and all of the KODT fans who pledged to support the original project. I wish Ken the best, but my efforts to rescue this project are now complete. Yesterday I posted about an apparent issue I had with Wizards of the Coast regarding their organized play program. As it turns out the reason I can no longer access my events is because the FLGS changed owners; I haven't been there for a month (been busy moving in to a new home), but although I was aware it was going to happen I didn't think it happened so soon. Apparently I need to get authorization from the new owners to run any events there. Since I am currently without a car, that will have to wait. That explanation is acceptable, but I have to admit the manner in which they handled it really needs a lot of work. The reason wasn't vocalized to me until I was locked out, submitted a customer service ticket and had it "escalated". Furthermore, sending an email to me saying in effect "we think you're a fraud" and that I need to be "educated", and then simply locking out my account without any warning, is definitely inappropriate and just not cool. WPN, conceptually anyway, is a great concept. It works really well for WotC's bread and butter product - Magic: The Gathering - but I don't think it works as intended for D&D. The purpose of the program is to get people in the store to spend money on the product; sure it's conceivable for someone to be buying a new M:TG booster pack every week, but it's really hard to imagine someone buying a new D&D product just as often. Maybe I'm mistaken on this, but how often do the players participating in a D&D Encounters game change from week to week? Do you really get that amount of new blood in the middle of the campaign? Do they buy product from the store or do nothing more than take up space (at least from the store's point of view in terms of business revenue)? How often do the participants buy something in or out of the store? In my opinion, I agree that WotC should promote in store play as much as possible in order to help the local business but they should not lock out anyone who is trying to run a game outside of the store. Right now, unless you're a WPN event coordinator bound to a store, you have no access to the Encounters and Lair Assault packages and are simply not allowed to run it at an alternate venue (anything from the library to your own home). I'm not saying it should be that way right out of the gate - having a new product only available in stores encourages would-be players to go there - but eventually that product should be available for anyone to run it. In a few months I should be able to buy War of Everlasting Darkness for the regular ticket price of an adventure, not for $200 or more on eBay. A few weeks ago, on October 31st, I received the following email from Wizards of the Coast through their customer support site. The Wizards Investigation Committee is sending this letter to follow up on the recent phone call you received from your WPN Representative. This phone call covered ways to avoid the conduct listed below in your future Wizards Play Network activities. We are aware that many violations of event policy are due to a lack of knowledge of proper WPN procedures. This letter serves as confirmation that your WPN representative has educated you on proper WPN procedures in order to avoid these issues. If any of the above issues detailed in this letter were not covered or clearly explained we strongly encourage you to contact your WPN representative with any additional questions. We appreciate your cooperative efforts. First off, the ticket was entered in the system and immediately flagged as "Solved", so there is no discussing it. Secondly, they provide no phone number in order to talk about anything; I tried to look for one through the site, but the only form of contact is through email or through the customer service site (I ran in to this problem before). Finally, let me go on record and state that I never received a call from any WPN Representative, so I have no idea what they are talking about. I considered the above letter a nonsensical warning, a form letter sent to most event coordinators at some point as a deterrent. The events that I have sanctioned through the Wizards Event Reporter - and I admit there hasn't been a lot of them, and it's been a while since I've been able to run anything due to real life situations - have been genuine and with real players. So I effectively ignored the letter. Well, a week ago I suddenly find myself unable to log in to the Wizards Event Reporter or the WPN website. At first glance it appears I have been locked out of sanctioning any more events and reporting on events already in the system. I have contacted WotC customer service. I am hoping this is an error on my end, such as a bad or forgotten password, and that it's not what I fear: that I have been flagged as a false reporter and banned from coordinating any events, without any further notification from Wizards of the Coast. As soon as I learn more, I'll let you know. Have any of you been "educated" in this manner? Has Wizards of the Coast questioned your integrity with such force? UPDATE 11/27/2012: It turns out that I've been blocked from running events at the store because the store has a new owner. You can read the details in my supplemental post, Continuing Education. I was looking forward to the opportunity to DM my first live game in over a decade. I prepared two campaigns: one homegrown and simplistic, the other was Revenge of the Iron Lich. Last week I offered the idea of RotIL to the players at the store, but I don't think the concept of it really sank in with many of them. Although I think they would have enjoyed it, they didn't seem all that interested in doing something different. Maybe it's because I'm a newcomer and they don't know who I am or what I'm capable of, and I have to accept that if that was the case. But running what amounts to a "pick up" game at a FLGS is not that simple. The store owner doesn't help at all. In the case of this store, the owner is heavy in to Magic: The Gathering, as can be expected: it's a cash cow and probably the primary source of revenue for his store. So he seemed rather disinterested in anything else, and left it up to the players to arrange WPN events all on their own. Today, half the store was taken up by the Star Trek Fan Club, which consisted of a bunch of guys older than I am taking up a half dozen tables with their various Enterprise models and cardboard stand-ups of ship captains, and sitting around talking Star Trek. I'm not sure why they were there or what they hoped to accomplish, but between them and several tables of card games (MtG and other card games; I don't know which), we were pretty cramped. There was barely enough room to run Lair Assault, and I can't imagine running something like RotIL which has a much larger map. The primary game organizer was not there today. There was no organization or scheduling of games; people just showed up in the hopes of playing. Again, this could seem that way simply because I'm an outsider and don't have the level of communication other players do (who, for all I know, see each other every day). But besides word of mouth there does not seem to be any planning or precise event scheduling, so it's impossible for an outsider to plan their participation. I tried to gauge interest by posting on the store's Facebook page. I got one person interested, and that person canceled this morning. So I cannot recruit players; if there are players out there they aren't on Facebook, or at least don't follow the store's page with activities. I suggested to the owner "...that maybe Encounters could be run on other days?" He looked at me as if I was crazy. Wizards of the Coast "kind of expects this to be run on Wednesdays", and a 7:30pm start time is kind of a hard sell. But if I decide to run it on a different day or at a different time, how would I get people to attend? I can't put those off days on the WotC store locator because, as per their guidelines, Encounters *must* be on Wednesdays. So because of all that, I was unable to run my own game; at this rate maybe it isn't meant to be, at least at this locatin. The group, without my knowledge, decided to go for the "everyone is the same race" achievement. Being a controller: forced movement and dazing effects, with the hope that we can push things aside and run right through it to the boss. Cold attacks. This one was common sense: if you're in a zone that's filled with lava, cold attacks must be really useful... Right? So I had to spend a bit converting my tiefling in to a gnome. If I must, I must... Although Fade Away is probably much more useful than Infernal Wrath in a place where everything has fire resistance. This might have worked well except for one thing: by the third round, I was unconscious. Why? The DM, and I'm not making this up, rolled THREE consecutive critical hits against me within the first two rounds. The only thing I managed to do before going down for the count is activating Wizard's Fury and firing one Magic Missile. Even with using interrupts like Shield and Fade Away, I was at -4 hit points at the end of round 2 due to two critical hits. The healer revived me, only to get hit with the third critical hit that took me down again. After that, the party left me to die as they continued forward. I failed my first two death saves before the "very bad thing" happens (if you've played the module, you know what I mean) and killed me outright. All in all it was an entertaining experience, but mostly due to the social aspects of the game. Nobody enjoys getting mercilessly beaten to death by an unforgiving d20, but it was cool all things considered. I did learn a lot: the group has gone through this campaign several times before, so they knew exactly what needed to be done and what special powers would benefit them. I had to leave before the end of the game - I did die 30 minutes in, after all - so I'm not sure if they made it. They were doing fairly well and had a lot of time left, so perhaps they did. For what it's worth, thanks to my participation in this game I think I now have my DCI number issues sorted out. I'm officially registered, so now I can really be a WPN event organizer! Woo! I don't know when I'll ever get to DM a game in person at this rate. Maybe it'll just take time, getting to know the players that are there and convincing them that I can do this, but even then it's going to be hard to get everyone there in an organized manner. There is another option: online play, using any number of social networking services like Google Hangouts, Skype, etc... It seems that I may have to look in to getting a decent headset and microphone, and then seeing who out there wants to run a game and what kind of game. Until then, I have a box labeled "Revenge of the Iron Lich"... A modern day Pandora's Box, just waiting to be unleashed on unsuspecting masses. Yesterday I had the opportunity to stop by my FLGS and get to know some of the players and DMs there. I also got the first chance to see the new Lair Assault Forge of the Dawn Titan. I was not an active participant because I got there too late and there were too many people wanting to play (8 people were in line), but I did manage to sit by and watch, occasionally flipping through my recently acquired Mordenkainen's Magnificent Emporium (great book BTW, but that's a talk for another day). I must say, it was an interesting experience. Now I admit I didn't experience the entire adventure, and I resisted from reading the booklet itself (I was asked to DM a late game, but car troubles prevented that from happening. Not to mention I brought zero materials), but what I saw makes it quite an entertaining experience. Many have compared it to Fourthcore, but it's not quite that extreme: damage output is pretty high, but there are no "save or die" situations (at least none that I saw). And since it is effectively one long encounter (no rests at all), resource management became a big issue real quick: a normal party might be OK with one healer, but imagine how well your group would do if that healer can only heal you twice during the entire game. With a group consisisting of one "passive" cleric, three strikers and one defender (notice: no controller) I was surprised that they made it as far as they did: two players made it to the end chamber only to run out of time (you only have 20 turns, or four minutes of "in game" time, to complete the encounter). This experience, even if I was only an observer, has inspired me to offer running a game next weekend. And, without knowing what the players at this FLGS want but seeing how well they reacted to Lair Assault, I am considering running a Fourthcore game. Which one is to be determined: it'll either be "Iron Lich" or "Crucible", and which one I choose is really dependent on the level of interest in the players and which of the two they prefer running. But I have to admit something: I'm kind of afraid. You see, I haven't run an "in person" game in over a decade, and I don't know if I'm ready just yet. Sure I know the mechanic and the game rules, but DM-ing is sometimes much more than that, especially in a Fourthcore game that tests the abilities of players and the DM alike. The biggest obstacle right now is that I don't have the materials: all I have is dice. I do not have a DM screen, miniatures, status indicators, etc... And the group is somewhat of a rowdy bunch, so I question whether I'll be able to maintain control over such a crowd of people much younger than I. So in the next couple of days I have to suit up and be ready, just in case this does in fact become a reality. I don't know if I need a DM screen right out of the gate, and I can do with traditional pen and paper instead of the GameMastery Initiative Tracker (which I would have bought if it weren't for said car issues), but I have less than a week to think about what I'm going to do about miniatures and game markers. So for the next week, I have to prepare myself mentally and see if I'm up to the challenge. If it goes well, I might start doing some WPN-level DM-ing. In the meantime, two of the map packs that I have created: M1: The Wayside Inn and M2: The Ring of Stones are available on DriveThruRPG! Just for reading this blog, for a limited time I'm offering a small discount on each of the items: just click on the above links to take advantage of the special pricing for the next two weeks!